Big commercial buildings have a need for large scrubber dryers to clean their large open spaces, these machines have hefty water capacities and long battery life enabling a deep clean without stopping. The challenge presented was that commercial buildings also have smaller spaces to clean, such as toilet cubicles, stairs and under tables. This results in extra costs having to buy a separate smaller machine, labour costs are increased in returning to those same areas, or even worse, less effective methods are used such as mopping resulting in a poor clean. MotorScrubber have pioneered in cleaning small spaces for over 12 years and we have been developing MotorScrubber FORCE, a super heavy duty accessory tool to fit onto any medium or large scrubber dryer. 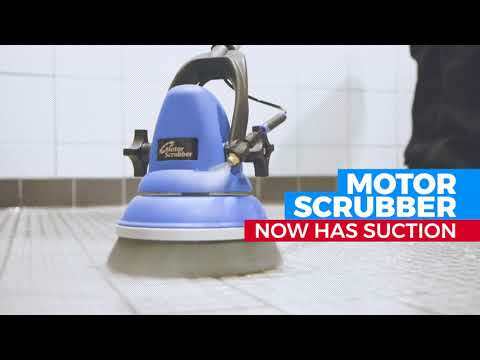 By adding MotorScrubber Force to your scrubber dryer you can now machine clean and dry anywhere even down the side of the toilet which no other scrubber dryer on the market can do. The major advantage is that Force connects to your large scrubber dryer using one hose. Within the hosewe connect the batteries, clean water and suction. This makes Force so easy to use, you don’t have an additional battery to charge, or tanks to fill and empty, all of this is done on your large machine as routine. Force offers even more advantages; you can clip off the tool in seconds meaning you can clean the small spaces as you pass them with your scrubber dryer and no more down time going back to the cleaning cupboard to grab a mop or smaller machine. Force delivers industrial cleaning performance on a small scale, achieving the same cleaning result as the larger scrubber. Every single component is specially selected as the most durable component available; where added strength is needed we use cast or machined aluminium to create an industrial grade tool to be used by professionals. Force is extremely well priced, costing less than buying a smaller scrubber dryer to clean those small areas and can be fitted in less than 30 minutes by a trained technician. This ISSA Innovation Award winner is currently in development due for release 2018.